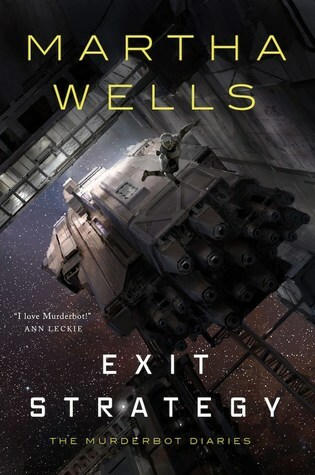 Late last year I read Martha Wells’ All Systems Red the first book in her Hugo, Nebula, Alex, and Locus Award-winning, and bestselling series, The Murderbot Diaries. The series features a human-like android who keeps getting sucked back into one adventure after another, even though it just wants to be left alone, away from humanity and small talk. Its perfect day is holed up somewhere dark and quiet with its entertainment feed. I can relate. I travel the last two weeks of the year to see family and friends for the holidays and that means no less than three flights and various amounts of time in airports. I usually take a break from reading and reviewing during those two weeks to recharge and only read something light and fluffy that I can pick up and put down between flights. I thought the next three Murderbot novellas would be perfect for that goal, and I wasn’t wrong, although I vastly underestimated how long they would take to read (in my defense ASR is only 90 pages on my nook, the other three are all over 150 pages so I had nearly double the amount of reading to do than I thought). The second novella picks up with Murderbot on the run having left Dr. Mensah and her team to deal with the fallout of the action in All Systems Red the newly free Murderbot is on a mission of self rediscovery, heading back to the place where it thinks it killed all those people and knows it had its memory wiped. While on the hunt for its own history Murderbot picks up a new friend in ART (whom I also adored, so competent much helpful) and a new cadre of humans in need of being kept alive. Murderbot is actively telling us the story and it could be off-putting, but since Murderbot is self-referential and sarcastic it keeps the narrative moving along quite well. 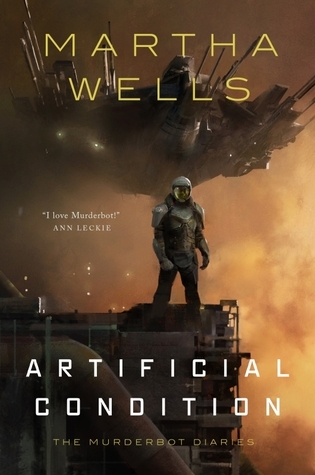 Wells also explains the corporate centric nature of her future as well as the differences between constructs such as Murderbot and augmented humans in such a clear way that the reader isn’t lost in the jargon but instead immediately understands what it is that Murderbot is facing at each turn as it struggles to get its own information, blend in as an augmented human security consultant, and keep those pesky programmers alive. I enjoyed this one less than the previous two, and I think its because I never really connected to the non-Murderbot characters (Miki was nice and all, but no match for ART or Dr. Mensah). Based on what it learned in Artificial Condition Murderbot is off in search of the next piece in the puzzle that connects its own past to what happened on its mission with Dr. Mensah’s team. We have a relatively similar set-up to the previous outing, hitch a ride on a transport, meet a “friend”, accidentally end up with a human client in need of being kept alive (whether they know it or not), and a hunt for information and a fight to get out alive. Like I said, its good, I just didn’t love it as much as its predecessors. With the fourth installment we are back to the Muderbot relationships we know and love. Dr. Mensah brings out the human in Murderbot in a way no other character does. This story is also action packed – we have to get to Mensah, find Mensah, free Mensah, and then survive long enough to get back to Preservation… where Murderbot has to literally discover who it was and who it wants to be. I’m counting these three for task 7 in the Read Women 2019 Challenge, read a book featuring a female scientist – these books are LITTERED with female scientists. So many in fact my brain kept forgetting that it was mostly reading about women outside of Murderbot (who has no gender). Wells packs her works full of supporting and tertiary female and third-gendered (ter) or non-gendered characters where more traditional or conventional writers would have had strictly male characters. A boon for us all and a refreshing change of pace. Share the post "Muderbot and I Share So Much"
And now we wait for 2020 . . .
Who the hell wrote those Amazon blurbs? Technically, they are accurate, but the tone of them is like if Micki was telling Murderbot’s story. On reread, I found I liked Rogue Protocol more than my first read through. They are horrendous, but I was also struggling with how to describe each book as I read them all in one fell swoop. Rogue Protocol definitely had middle child symptoms for me (I knew we were headed for Mensah and I just wanted to be there already) so it is probably better than I’m giving it credit for here. Oof, I wrote my comment before I had my wake up coffee. I was not intending to imply anything negative about using those blurbs. And, you are right, Rogue Protocol does suffer from middle child syndrome. I reviewed it with Exit Strategy because I didn’t know what to say about it on it’s own merits when I first read it. Oh I knew you weren’t saying anything bad about using them – I had exactly the same reaction to their tenor. There’s definitely something to the Miki story… I just couldn’t put my thoughts together on it for this review. I really liked the Miki character, because Murderbot reacted so strongly to it. Miki is like a foil that Murderbot is aware is his foil. Miki makes Murderbot extremely uncomfortable. I did like how Murderbot has to figure out how to communicate to Miki knowing that Miki is going to eventually break trust with Murderbot to keep trust with her humans. It is baffled, but also oddly jealous about the whole thing. I think the discomfort there stems from Murderbot’s inability to accept his own personhood. It’s something it struggles with all four books. Miki accepts hers unthinkingly, and her humans treat her like a friend. Murderbot is jealous, yes, because Miki seems to naively accept something Murderbot has to struggle with. I also think Murderbot has issues with its hybrid nature. Murderbot is not a pure robot like Miki, and not a human either. Yes… that does work with my notions of the Murderbot/Miki relationship. Murderbot is fighting its own personhood (refusing to be anyone else’s version while simultaneously not having its own version) but wanting to find its place. 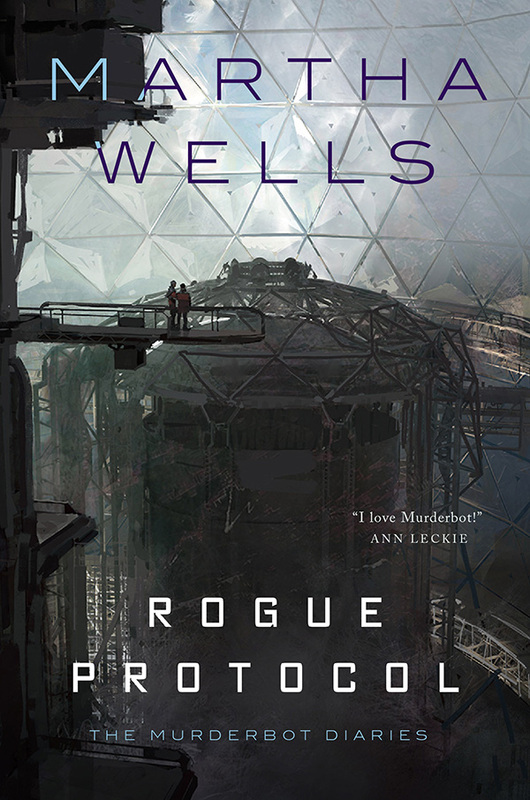 I’m really wondering what Wells is going to do with Murderbot’s personhood struggle in the novel, that has to be where she’s going, the novellas have built entirely in that direction.